Carrying on with my anecdotes about the various interesting people I've met and captured in pencil or paint, today I'd like to talk about the most humble, placid and caring person I've ever had the privilege of meeting. A number of years ago when waiting on board a Thai International flight in Thailand en route to England, a small figure dressed in white with a blue-bordered headband was ushered into the vacant seat next to me. She had the most lined, but kindly and serene face I'd ever seen. It was Mother Teresa! Clutching a large and tattered carpetbag, her old grey woollen pullover had holes in the elbows and looked almost threadbare with use. After we exchanged hello's and took off, she delved into her bag and pulled out a prayer book with outsize lettering and, clasping her hands together, silently prayed. 'This is one aircraft that wouldn't dare crash' I thankfully thought. "I don't know why I've been put up here." she said, "as I always travel economy class." 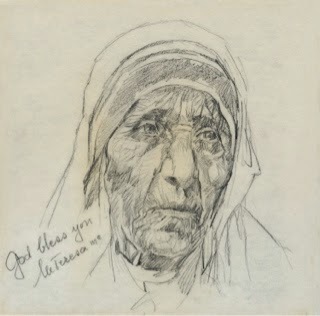 Mother Teresa is Albanian, and not wanting to disturb her too much, when I asked her how long she'd lived in India, she answered with the words "For more years than you've been born, my son". ( I was younger then.) During the flight we both gathered extra food and fruit and filled a couple of sick bags. "For the poor children of India' she said. Truly the most modest person I've ever met, her serenity shone through every pore in her amazingly lined and character-filled face. I felt I was privileged to be In the presence of a true saint. Her Nobel peace prize was just one of many that had been awarded to her, but when I remarked on her achievement, she merely brushed it aside as immaterial. Towards the end of the flight to Delhi, after she woke up from a little sleep, I asked whether she'd allow me to draw her portrait. Modestly, but reluctantly, she agreed. The only paper I could find to draw on was the back of an old art catalogue. As I sketched the lines etched into her face seemed to dance around in intriguing patterns whenever she spoke or smiled. A Thai man in the seat opposite took photographs of us. 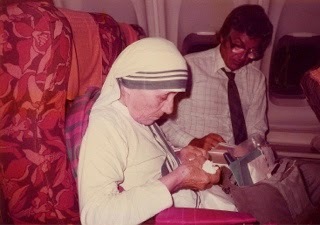 When I arrived home later that evening and turned on the television, one of the first items on the news was Mother Teresa being presented with the Order of Merit by the Queen of England in Delhi - and she hadn't even mentioned it to me as we chatted. Months later I received a copy of the photograph taken by the Thai man, from the Thai Embassy in Belgium. The drawing, now framed, is among my most treasured possessions. A couple of weeks ago my young friend had a very interesting experience. She went down a uranium mine in The Czech Republic. After about a six hundred metre descent in a tiny lift when she reached the bottom a further 20 minute journey on a smal truck took her to the uranium face. 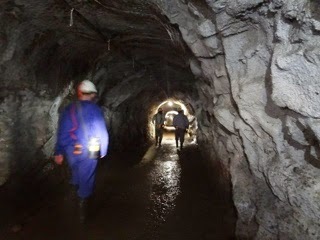 She and her colleagues were the only non-miners ever to go down this mine. Here is a view towards the entrance after their return. 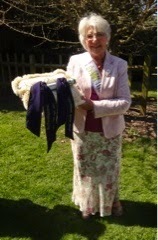 Last weekend we visited my friend Christine in Norfolk. 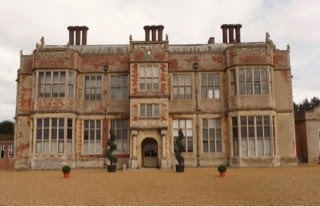 While there we spent Saturday at Felbrigg Hall. An estate of about 800 acres it features a great wood with a brick icehouse at the end of a 29 foot deep shaft, and a Victory V, planted in memory of the squire's brother, who was killed in the Second World War. 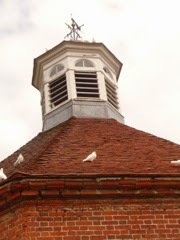 This dovecote can house 1,000 birds. 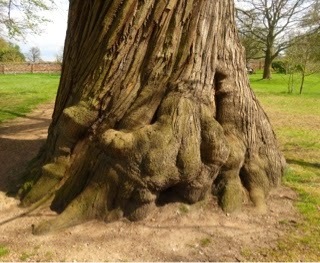 And here is the sessile oak. It's over 500 years old. 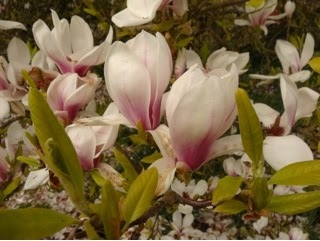 A few more views around the gardens. 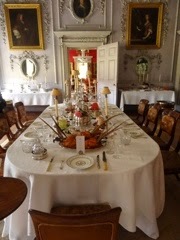 However the inside of Felbrigg Hall intrigued me most. 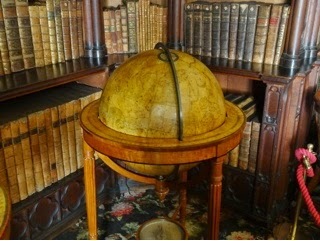 I loved this beautiful oil globe of the world in the library. 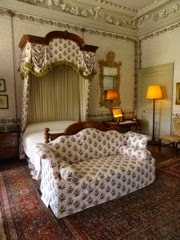 And how about this for a comfortable bed chamber. 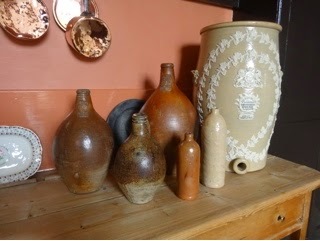 Every room has something of interest to see. As you approach the library a hidden door swings out to reveal another tiny book-lined cubicle with an ornate chamber-pot prominently dislplayed on a shelf. Just in case a visitor was caught short on their way round the house. (I don't think it would be much appreciated if one of today's visitors took advantage of it however!) 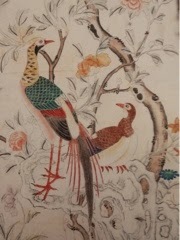 Finally a picture of one of the hand painted walls in the Chinese room. My young friend's garden is springing to life now that spring is here. 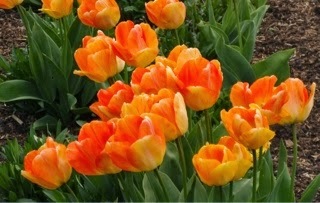 We came back from Norfolk with a car full of new plants - including the orange trumpet climber she's been looking for. She spotted it at West Acre Gardens - the specialist plant nursery set in an unusual D-shaped walled garden of an old Norfolk manor house. 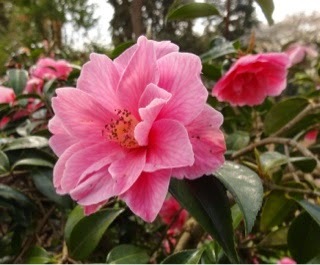 Christine said that whenever she takes friends around the gardens they always buy something. MYF's garden now has another beautiful clematis, more fuchsias, and several more plants I can't put a name to. 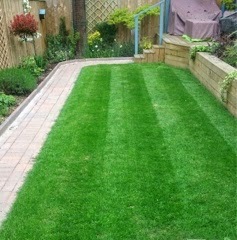 Her lawn has recovered from winter (when I thought it had lost some of its sparkle) but here it is today looking nice and green. In a couple of weeks when, hopefully, the fear of frost has gone away, we can plant out the sweet peas she has nurtured in her little grow-house. 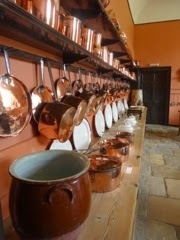 So much pricking-out and potting-on, I hadn't realised how finicky those tasks are. My sister-in-law, Val, has recently become the President of Greys Women's Institute. 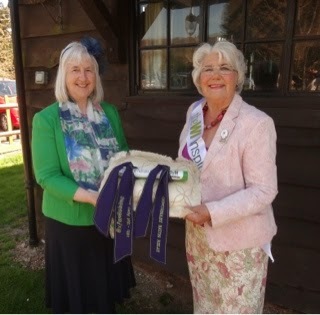 Last week marked the WI's hundredth anniversary. To mark the event a baton has been taken around every WI in England. 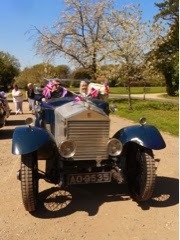 A vintage Rolls Royce brought it to Greys in style. Here the baton was handed over to Val. 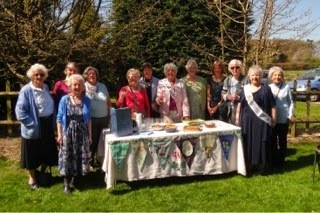 And in glorious April sunshine, some of the Greys WI ladies. 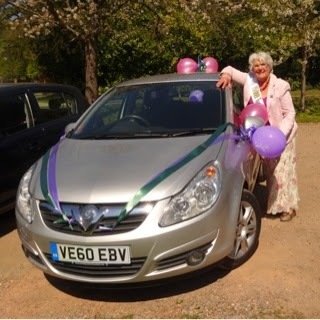 Val even decorated her car in WI colours for onward transport of the baton to Greys Court in Henley. I've just finished my large oil painting of the boatman for submission next year to the National Portrait Gallery's BP Portrait Award. I had painted a large watercolour of the same man, in a different pose, for submission this year, but at the last minute found out that watercolours were not acceptable. So I've carefull re-read the rules this time. Luckily I did because I discovered that no signatures are allowed on portraits. They also state that any deviation from the rules will mean instant rejection. I'll post a picture of the portrait next time after I've varnished it. Finally, have you noticed that so many people start sentences with the word 'So'. Lately, listening to radio interviews I've been so aware of this fad. It's as if you are joining someone in the middle of a sentence.